Blog :: Motorcycle Parts Ltd. Inc.
It’s that time again… TeamScream’s annual road trip to Big Bend Texas. The bikes are prepped almost loaded for another great getaway. With the recent rains it looks like our using of the moon phases to pick our escape week (for the optimal star party at McDonald Observatory) works out perfectly. Steve and his new Hardley, well he may just come across a few signs like these. Kirk well – We just hope he’s learned his lesson not to use ‘Race Tires’ on long road trips. I’m sure he’ll have a surprise for us all. The motorcycle magazine American Motorcyclist announced that the Bureau of Transportation has ruled (ECE 22-05) that modular motorcycle helmets (flip-ups) are no longer allowed to be opened single-handed or while riding a motorcycle. For safety reasons, they do not want riders riding with the helmet in an open position (currently illegal but tolerated), so require all modular helmets to be retrofitted with a special device that will require two hands to open the helmet. The safety device will cost $19.95 and is called a HSB – Helmet Safety Belt. They even provided information where to buy the kits. Newly approved flip-up helmets will have a label inside with letters “AF”. Also the Texas legislators are now requiring front license plate for motorcycles or requiring a license plate mounted on the front of motorcycle helmets as photographed in this early prototype below. Come one, come all, it’s free & fun to Join Rocky Mountain Fantasy SX. Make your predictions for each round of the 2015 SX series and possibly win prizes and defiantly bragging rights. We have two organized local groups you may join (open to anyone – no password required). Times are tentative and subject to change. 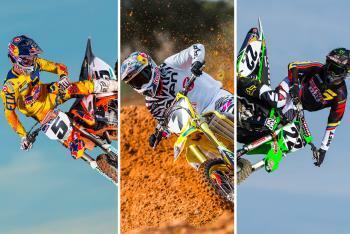 Make your picks (prior to each SX event). Join the Groups AMSAClub and/or Team Scream. Wait, watch SX, & check your stats. This RMFantasySX has no affiliation with MCPLtdInc, what so ever. We’re simply spreading the dirt, so put your boots & helmet on and prep for a seat-bouncing SX season. Please note: If you forget to log in on a specific round and don’t make submit new picks your previous picks will roll over to the current round. However, rollover picks are not eligible for weekly prizes. *Your 2 lowest scoring weeks will be dropped from your overall total at the season’s end. Who doubts Reed? Is Dungey still Dungey? And what about that other former champion? Is this time their time? 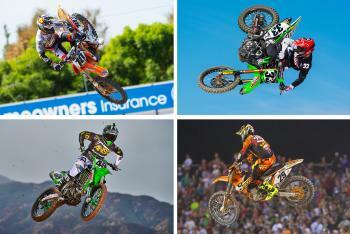 How will Canard and Millsaps rank against this year’s 450SX field? 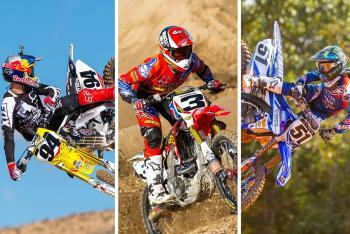 Anderson, Baggett, Seely, and Wilson. Which rookie will take top honors in 2015? Brayton, Grant, Hahn, Hill, Peick, Short, Tickle, Weimer. Those are a lot of fast names for just one podium! 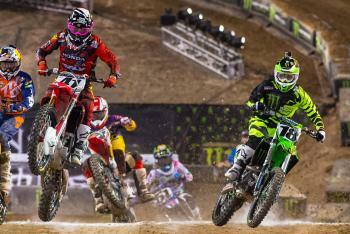 Check out the track layouts for the 2015 Monster Energy Supercross season. Feld Motor Sports released track designs for sixteen of the seventeen 2015 Monster Energy AMA Supercross Championship rounds. There are some interesting designs, which you can view below, including a return of the over/under bridge at Atlanta 2, and East Rutherford. (Steve Matthes is a very happy man.) We will have more information in the coming days, in the meantime check out what’s to come in 2015. 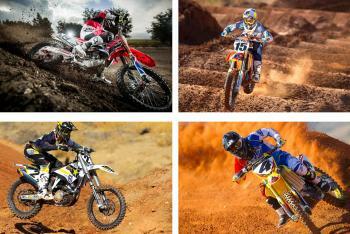 KTM has announced the release of the 2015 KTM 450 SX-F and 250 SX-F Factory Edition race motorcycles that will be raced by the Factory backed KTM squads starting at the opening round of the AMA Supercross Championship on the 3rd of January. This year marks the fourth year of a new 450 SX-F Factory Edition motorcycle and the first year that KTM has released a 250 SX-F Factory Edition. For the 2015 model, KTM has stepped up the game once more and developed a whole new generation SX model motorcycle. Both the 450 SX-F and 250 SX-F Factory Editions have been developed with the primary objectives of weight reduction and mass centralization for improved performance. Both motors have been completely redesigned to be lighter and more compact while producing more power. The new engine cases on both models are redesigned to centralize the rotating mass of the crankshaft and clutch while reducing the overall length. Both models have a reworked Keihin Engine Management System with new 44mm throttle body and a new electronic launch control for efficient starts. New cylinder heads, revised valve trains, new combustion chamber geometries and optimized ports increase performance along with a new 5-speed transmission on both models to provide precise and easy shifting. The chassis is completely reworked with a lighter chromoly steel frame that provides improved handling and energy absorption. A lighter subframe and swingarm match the new frame characteristics. The WP 4CS fork and brand new designed WP shock have been specifically designed for motocross and features revised damping settings optimized for the new chassis. The new upgrades result in a nearly 7 lb weight-reduction on the 250 SX-F Factory Edition and a remarkable 10 lbs on the 450! The Factory Edition models come with other add-on benefits including: Red Bull KTM limited-edition graphics, Selle Dalla Valle Factory Race Team seat, orange-anodized rubber mounted triple clamps, lightweight Galfer Wave rotors, CNC-machined hubs, high-end Excel rims fitted with Dunlop GEOMAX MX32 tires, KTM/ODI lock-on grips, KTM PowerParts fork mounted start device, engine map select switch and a KTM PowerParts hour meter. For 2015, the 450 SX-F Factory Edition will be the bike of choice for Red Bull KTM Factory Team riders Ryan Dungey and his new teammate Dean Wilson. In addition, the BTO Sports/KTM Team will also use this race machine with team riders Andrew Short and Justin Bratyon. In the the 250SX Series and 250 Motocross Championship Red Bull KTM Factory Team riders Marvin Musquin and Justin Hill will utilize the 250 SX-F Factory Edition alongside the Troy Lee Designs/Lucas Oil/Red Bull/KTM Team of Jessy Nelson, Darryn Durham, and Shane McElrath. Do you still use a GoPro2? The “World’s Most Versatile Camera” introduced an upgrade last month with the release of the HERO3+, an upgrade to the HERO3 from 2012, which was an upgrade to the HERO2 from 2011, which was an upgrade to the HERO from 2010. Technology will always be one step ahead of your buying decisions – just ask Apple iPhone owners – but unless you’re the type who invests in the latest and greatest, as-soon-as-it-comes-out gadget, you may be reluctant to invest in every single upgrade whether it’s a phone, computer or GoPro camera. GoPro changed the way we view power and action sports forever with their high-definition personal cameras that capture stunning images that previously were either impossible or required expensive professional equipment. The GoPro2’s impact to the sports world was unmatched as it provided an easy to use, rugged, and durable camera with 1080p video resolution, an 11 MP image sensor and improved low-light capability with recording speeds up to 120 frames per second. The HERO3 arrived offering three versions in November 2012 and improved specs like a 12MP sensor capable of capturing 4k digital video at 15 fps and wifi built in, among other features. Last month the HERO3+ Black Edition grabbed headlines with even more improved specs (12 MP at up to 30fps) to the existing multiple video modes of 1440p48, 1080p60, 960p100 and 720p120, increased resolution, increased field of view, dramatically low light performance and a lighter and smaller casing then last year’s model. To put in bluntly, the HERO3+ is in a league of its own and even the company’s past products are no match for the latest technology engineered into the HERO3+. The difference two years makes? The HERO2 isn’t even available to purchase anymore. Comparing the HERO3+ to the HERO2 is like comparing the iPhone 2 to iPhone 5 – it’s that big of a jump. However, functionally speaking, iPhone 2 still works and offers advanced technology many users are happy with it. Therefore, if you own a HERO2 you may be settled with what it offers and if you are an occasional rider and find entertainment value in setting up your camera to capture moments on the track or trail to share with friends it may not be worth spending the money to upgrade.